It may be true that the top earning movies may not necessarily have been the best selling music of the time or vice-versa but the purpose of the article is not to consider the musical merit of the movies, it is simply to analyze and highlight Rafi’s contribution to the biggest box office successes across those years. I provide at least one Rafi song against the name of the listed movies that featured his voice. The choice of the song is random whenever there are multiple Rafi songs in a movie. First let us start with the decade of forties. The top thirty box office hits of 1940’s bring to fore the contributions of early Rafi. The great singer had started his career in this decade sometimes singing as a part of chorus and at other occasions lapping up bit assignments. However in a few years he left such an indelible mark in playback field that by the end of forties he was one of the dominant voices in the industry. 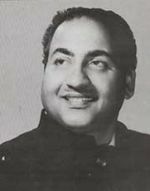 The assignments in Anmol Ghadi, Barsaat, Mela, Pyar Ki Jeet, Dillagi, and Shaheed are high points of Rafi’s box office success in forties. In the following list of top thirty movies the only credible competition Rafi had from then breed of new singers was from Mukesh (in Andaz, Mela and Barsaat). That said Mukesh had multiple hits in these three movies as opposed to Rafi’s one hit in each of those. Mukesh got very quick acceptance with the masses owing to his tonal resemblance to then reigning voice of inimitable K L Saigal. Rafi’s other illustrious colleague Kishore Kumar also started his singing career singing for Dev Anand in Ziddi in 1948. A quick look at the top thirty hits of forties show Rafi’s association with at least 9 movies that includes the film Shahjehan where he got to sing a line “Roohi Roohi” with his idol K L Saigal. Come 1950’s and we find Rafi’s dominance at box office increasing considerably. Talat Mehmood had already earned name in “ghazal” renditions when he joined the Hindi Film Industry towards the end of the forties. A whole generation comprising of new talents such as Hemant Kumar, Manna Dey, Rafi, Kishore, Mukesh, Talat and later Mahinder Kapoor had set out to enrich the playback scene in Hindi Film world. Talat got notable assignments in the first few years of fifties and during that time it primarily emerged as three-way competition among Rafi, Talat and Mukesh. For some key films Talat became Dilip Kumar’s voice as well. The versatility, focus and diligence on Rafi’s part prevailed and Rafi went on to rule the fifties box office landscape leaving his competitors behind. A look at top thirty films of 1950’s shows that Rafi contributed big time to as many as 14 box office hits. This was the highest for any male singer in that decade. With the onset of seventies, Rafi’s contribution to the box office successes diminished to some extent in contrast to his performance in sixties. A look at box office top thirty of seventies shows Rafi’s contribution in 17 films, 2 films fewer than Kishore’s 19. Mukesh continued his run till his untimely death in 1976. Mahinder Kapoor, Shailender Singh, Manna Dey and Yesudas were other prominent players in this decade. A closer peek at box office toppers of seventies reveals that film producers employed myriad actors and singers to ensure success and better return on their investments. This trend was in vogue in seventies and continued till 1980’s. At the turn of 1980’s, Rafi was getting even busier than some of his previous years. The enormity of his contribution to box office successes in eighties is evident from the fact that despite his untimely demise on July 31st 1980, we find him share credit in as many as 8 films out of top 30 films. In the overall analysis of these biggest box office successes across five decades it is clear that Mohd Rafi had the highest share in the male playback domain. Of the 150 films sampled, Rafi contributed to 77 films (and at least 25 or more films came into being when Rafi either hadn’t arrived at the playback scene or had left his mortal frame). No other male singer till date has enjoyed the same magnitude of success as Rafi did across those years. The readers are welcome to confirm this assertion. Rafi’s legacy lives on. This entry was posted on Sunday, August 29th, 2010 at 6:30 pm	and is filed under Meri Awaaz Suno. You can follow any responses to this entry through the RSS 2.0 feed. You can leave a response, or trackback from your own site. Rafi is great men, Is vioce is supereb. 1990 Is song is popular. Attraha baras ki tu sing Amitabh.then Sing another song to Amitabh: Mere Desh Premiyo,Aaps prem karo. ect. Mithun also sung of Rafis voice song; Tu Hi Woh Haseen. very popular that time.Aap tau aise na the:Tu Is TArah se meri zindagi….many popular songs sings All filimi Heroes. superb informative article, the effort is truly laudable. most of the films listed above (50’s & 60’s)with music by o. p. nayyar, madan mohan, roshan, shankar jaikishan, s d burman, & laxmikant pyarelal are likely to have all male songs by rafi. there are many films which do not feature in the list of top 30, where all songs are sung by rafi, especially SDB, LP * O.P. and other lesser known music director, for reasons often mentioned in these pages, i.e. rafis verstality and genrosity and simplicity. Rafi saheb ek naayab ratn the maaf kare hai. Unki aawaz unki mrityu ke baad bhi abhi zinda hai .kaun kahata hai ki ve mar gaye hain. Sach hai geet sangeet ka koi dharm nahi hota.Rafi sabhi bhajan aur bhakti geet is tarah doob kar gaate the ki koi hindu bhakt bhi unke saame fail ho jaye. Man tarpat hari darshan ko aaj,O duniya ke rakhwale sun dard bhare naale,Madhuban mai radhika nache govinda aala re aala jara matki sambhal brijbaala,sukh ke sab saathi dukh m,ain na koyi aadi bhajan to sirf kuchh misal hai .Kahane ki jaroorat nahi rafi ji gayan ke har chhetra main bemisaal the.Kya yah hairaini ki baat nahi ki hindi filmo ke adhiktar sumadhur bhajan rafi+naushaad sahab+shakeel badayuni ke group se hi nikale aur teeno he muslim the? I was shocked to see what a site. Na hindu Banega na musalman banega insaan ki Aulad hai Insaan banega. Main kahi kavi na ban jaaon tere pyar main aye kavita. All the best collection of Mohd.Rafi. Good & True analysis, also to add to your analysis. 1. Sales from Rafisaab songs were more than Talat, Kishore, Mana dey and Mukesh till 1975. I am not aware of figures after that. 3. Rafisaab had more hits than any other songer betwen 1976 and 1981. Excellent work! although I personally didnt need this to tell me that Rafi is the greatest singer on earth, ever. It is a Great work and analysis. One can never forget Rafi, the singing icon. THANKS A LOTY FOR AN EXCELLENT EFFORT. FULL POINTS TO YOU AND RAFI SAHIB.. This write-up is outstanding & astounding. I congratulate Mr. Naveen Zalpuri for taking such a laborious task of compilation and the track record of past years. Yes, it is absolutely true that Rafi Saab is the number one singer who had given maximum number of box office hit songs during his forty years of illustrious career. This article is the combination of smartness and mature writing skills of Naveenji. I got to praise for his amazing effort that he put into this write-up. Aap ko ek suggestion dena chahoonga. Who log jo Whopopular.com par regularly Rafi Sahab ko votes dete aarahe hain aur jinke naam “The best fan of Mohd. Rafi” mein top 3 ya to 5 par hain, jaise Sanjeev Sahab jo kay top par hain (3311 votes) unke is pyar aur unke efforts ko appreciate karne kay liye aap ki site par unke liye kuch khaas hona chahiye. Jaise, Unka interview, unki picture aap ki site par aana chahiye, ya aap ke organize kiye huwe kisi concert mein unko special guest ke taur par invite karke unko phool mala pahnana ya shawl udhana etc. ya kuch aur tareeqa bhi hosakta hai. Aap sonchiye, Sanjeev Sahab 3311 votes jo diye hain to is mein in ka kitna qeemti waqt lag gaya. Daily agar 5 vote ka bhi average lete hain to is mein in ko 22 months lag gaye hain. Rafi Sahab se inka jo pyar hai, isi ki badaulat yeh itni mihnat kiye hain, aur yeh Rafi Sahab ka naam Dunya mein sab se oopar dekhna chahte hain. Aise Rafi Sahab ke sachche chahne walon ko hamein uthkar salute karna chahiye. Hats Off Sanjeevji. A very nicest anylysis you have carried on. ! Rafi Sahab is Rafi Sahab ! Cheers ! JUST TWO POINTS… U MENTIONED ABOUT LORD BUDDHA. RECENTLY IN A MEETING A TOP EXECUTIVE MENTIONED THAT LORD BUDDHA WAS FORGOTTEN FOR 300 YEARS UNTIL EMPEROR ASHOKA UNVEILED HIS GREATNESS. IN BOLLYWOOD A CERTAIN GROUP WANTED TO BANISH MOHD RAFI FROM THE RECORDING ROOM DUE TO PAST RIVALRY AND SELFISH INTERESTS. SONU NIGAM IN AN INTERVIEW HAD THE GUTS TO SAY THAT POST RAFI’S DEATH, THE MOHD RAFI WORD WAS TABOO IN THE RECORDING ROOMS. CAN A TIDE BE STOPPED? THE SELFISH ONES STAND EXPOSED . MOHD RAFI IS BACK IN PEOPLES MUSICAL MINDS. THERE WERE 9400 MUSICAL HOMAGES TO MOHD RAFI THIS JULY 2010. TELL ME WHICH SINGER IN THE WORLD IS REMEMBERED SO MUCH…. ONLY BHARAT KA RATNA MOHD RAFI SAAHEB. Mohd rafi is Mohd Rafi……………..
Dear jawed ji, “Jo mera dukh, wohi… hai tumhara bhi gham”(song janewalo jara – film dosti). Everyone of us feel the same for the greatest Indian singer, our Rafi sahab. He deserves more than what he got,but never because he is not Mohan ravi,a hindu. Such issue like “majhab” is not applicable here. Shahrukh khan, aamir khan, dilip kumar, Ar rehman, naushad saabApj Kalam etc r the muslims and more famous than anyone else in their field…and fame and reverence of Rafi sahab is no less among hindus in India or anywhere! With Rafi sahab story is different, politics that would surly have happened even if he were Hindu or rather a brahim Pundit! for masses to understand his divinity.Ram, a hindu God, when was in human Body only was recognised by 11 person while everyone else doubted and criticized him. . Gautama Buddha too had only few person who could love him then, but 200 yrs later they understood him when some king told it. common people do only what they see other-doing. No one see inside their own heart. Other singers, like the celibrities world-wide over-advertise their own songs, so masses could get it. They even go to Jail ,get married 100s times,just to remain in news! How can we even imagine Rafi sahab among these selfish celibrities who even never recognised his own voice as his but that of Allah`s blessing only never he! Even if a single person know about person humbly withdrawn inside like person Rafi its more than enough, yet the whole world know him. If u forget the awards and sick Fm radios or times group lobby, Rafi sahab is most loved singer of india… Anyone can verify on internet youtube, in.com etc! Anyway,bhajan of a Muslim Rafi sahab is more famous than any hindu singer whatsoever. U can see tomorrow is Krishna astmi– every where u can find Rafi sahab singing ,”Govinda alla re”. Hence Rafi sahab sings— “mero paas aao chhodo saara bhram”— Coming to Rafi sahab is a state beyond all the difference. Superb work Dear Naveen Zalpuri ji! We can see best era of hindi film music is when Rafi sahab sings most! WELL DONE NAVIN JI….NICE STATS of mohd rafi songs which have “stood” the test of time. the popularity of mohd rafi songs – is for all times. its there for every reason, season and each session of the day. time tend to stand still when mohd rafi sings. Exceptionally well reserched article. I have a little addition in your list of songs of 50s. There is a slong in Janak Janak Payal Baje wherein Rafisaab has landed his voice. The song is Rang Rang Ki Chunari Saari Ye Fulwari Mast Hawamen Udana” and if i remember well there is also a song in Babul wherein Rafisaab has landed his voice along with Talat Mehmood and Lata Mangeshkar (or Samshad Begum not sure) but do not remember words of that song. Very Nice article…you have taken out the whole history and it is interesting. Its a wonderful analysis of the greatest Indian singer ever and i repeat Indian singer, as by many Indians when a name is a non Hindu, its hard for them to consider them as “INDIAN”, just imagine if Mohd Rafi was Mohan Ravi, he would have been revered as Lata jee, though we and the world know that it was rafi jee who stood parallel with or even higer than these sisters, looking optimistically the new generation of Indians are getting more secular and open minded and in the coming years Rafi jee will get his due by awarding the BR.